Skin challenges aren’t you, they’re a message spoken by the body about its internal condition. Like everyday life, our skin needs change constantly. Your unique skin is our thing. And we treat it accordingly...individually. Step #1 -Therapeutic Botanical Precleanse, a low-maintenance guide to healthy skin. Use solo, or as part one of illuminate’s two-tier cleanse strategy to effectively remove makeup, purify, hydrate, exfoliate and decongest. Step #2 - Botanical Beauty Brick, part two of illuminate’s two-tier cleanse strategy - dissolve precleanse residue leaving skin fresh, purified and ready for PH balance and layers of carefully balanced, deep moisture. Step #2a - Prefer a liquid cleanser? Choose our Emollient Cleanser for deep purification, softening. Prepares skin in the same way as a Beauty Brick, but with the ease of a pump-ideal for dry, rough skin, but can be used by all! Step #3 - Active Botanical Mist, the antibacterial and anti-inflammatory benefits of colloidal silver, aloe and witch hazel unite to deliver hydration, purification and balance for all complexions, choose a bright Reverie of citrus and herbs or a Revival of deeply-moisturizing Floral and wood. Step #4 - Therapeutic Botanical Oil is a deeply penetrating layer of nutrient-rich, therapeutic hydration formulated to go deep. This unique small-molecule weight oil goes where no hydration has gone before and the only thing that could make this better is partnering it with part two: Active Botanical Hydration. 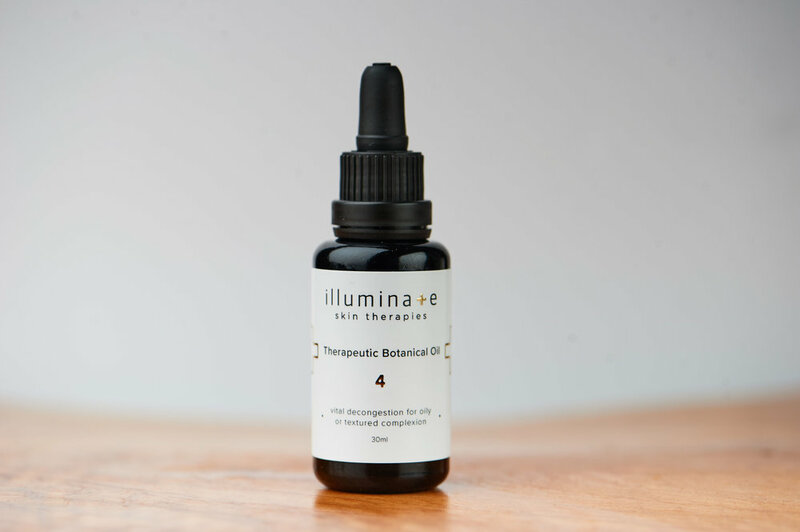 Step #5 - Active Botanical Hydration was formulated to be light, yet incredibly affective; particularly when partnered with Therapeutic Botanical oil. This smooth, emollient blend of organic plant-based carrier and essential oils and butters soothes, cocoons, and defends against all things dry. Step #5a - Active Botanical Balm is a unique hydrator in that it’s not emulsified with water, which means it’s rich, potent and formulated to protect-while still feeling light and breathable . Like all Illuminate products, this is a non-comedogenic (congesting) blend safe for all skin. Choose a lighter, vitamin-rich Reverie or a calming Revival of anti-inflammatory properties, blended to heal, protect and ultimately transform. Both Active Botanical Balms are incredibly anti-aging-Reverie is ideal for Clarify and Balance skin descriptors and Revival for Refine and Remedy!